The ever growing needs for computation power and accesses to critical resources have launched in a very short time a large number of grid projects and many realizations have been done on dedicated network infrastructures. On Internet-based infrastructures, however, there are very few distributed or interactive applications (MPI, DIS, HLA, remote visualization) because of insufficient end-to-end performances (bandwidth, latency, for example) to support such an interactivity. For the moment, computing resources and network resources are viewed separately in the Grid architecture and we believe this is the main bottleneck for achieving end-to-end performances. 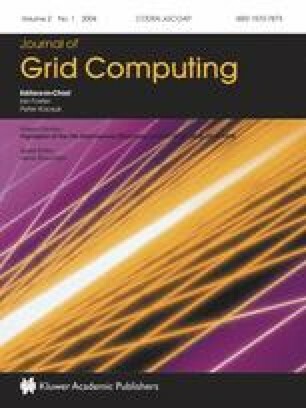 In this paper, we promote the idea of a Grid infrastructure able to adapt to the application’s needs and thus define the idea of application-aware Grid infrastructures where the network infrastructure is tightly involved in both the communication and processing process. We report on our early experiences in building application-aware components based on active networking technologies for providing a low latency and a low overhead multicast framework for applications running on a computational Grid. Performance results from both simulations and implementation prototypes confirm that introducing application-aware components at specific location in the network infrastructure can succeed in providing not only performances for the end-users but also new perspectives in building a communication framework for computational Grids.